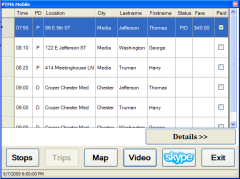 PtMS for Windows is a GIS map based paratransit order taking, trip editing, automated scheduling, dispatching, billing and reporting software system built on a SQL server database platform. The easy to use and intuitive order taking system will dramatically improve call response time. Advanced interactive and batch automated scheduling features allow users to schedule hundreds or thousands of trips rapidly. PtMS Web is a web based extension to PtMS for Windows that connects PtMS for Windows transportation brokers or coordinators to other transportation providers via the Internet.It allows transportation brokers or coordinators to distribute schedules and reports to providers, collect trip verification schedule results data from providers, and communicate with providers via secure web mail all in a secure HIPAA compliant web site. PtMS Mobile is the ABS mobile data system that works with PtMS for Windows. It features on-board vehicle computers connected to the PtMS for Windows SQL database via a cellular Internet connection that supports real time scheduling, schedule data capture, GPS tracking, instant messaging, web-cam in-vehicle video, and voice over internet communication between dispatchers and drivers. PtMS CAPS (Client Automated Phone Services) is a key add-on product for PtMS for Windows users to help reduce the number of no show trips and cancels at the door. PtMS CAPS can perform automated appointment reminder calls, phone messaging and notices to clients, client consumer satisfaction surveys, and automated trip confirmation surveys. PtMS CAPS can help save money and increase billable services. "With the PtMS automated batch scheduler I am able to complete my next day's schedule in minutes. The PtMS scheduler assigns the over 200 unscheduled demand trips to the best standing order routes with a few click's of the mouse. Within minutes I am ready to print schedules for my drivers."